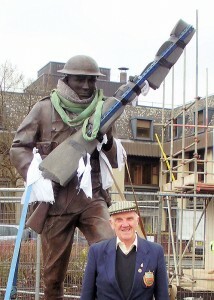 Normandy Veteran and Secretary of the Chorley & District Ex-Services Association, Stan Dickinson, was on hand to see the Chorley Pals statue arrive at its new home on the town’s marketplace on Thursday morning. A regular visitor to the First and Second World War battlefields in France and Belgium, Stan laid a wreath at the Chorley Pals plaque in the trenches on the Somme during 2008. His reaction to seeing the statue – “Stunning!”.